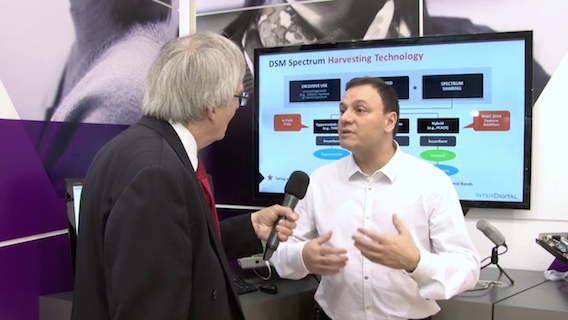 Interviewer: This is Brian Dolby, reporting from the Mobile World Congress, where I'm with Angelo Cuffaro, of InterDigital - more importantly, in this case, a member of the Dynamic Spectrum Alliance. Angelo, we're talking in that capacity today, but, obviously, your day job is very much with InterDigital. Tell us why it's so important to InterDigital to be members of the DSA. Angelo Cuffaro: We think it's extremely important to be members of the DSA, because we feel that it's very important that we use spectrum efficiently. And the DSA, their mission is to influence regulators, influence countries to make sure that spectrum is efficiently used. And as a company, we're developing technologies that try to do that - that try to develop new technologies that make spectrum more efficient - use new spectrum, use unlicensed spectrum - and basically develop technology that will make sure that the bandwidth crunch that's happening these days - and it's going to get worse, in terms of the video content - will be handled properly. Interviewer: Yeah, because it's absolutely critical, isn't it, that we get absolutely the most spectrum we can possibly get our hands on for broadband to spread? Angelo Cuffaro: Correct, yeah. I mean, you could see it with the 4K video that's already coming out - the larger TV sizes, the phones getting larger, phones getting faster. You know, the spectrum is running out. Of course, there's new spectrum that we're going higher and higher. We're going to 60 gigahertz, and higher and higher in spectrum, but then there's a lot of spectrum that's actually not very efficient. For example, TV whitespace. There's a lot of holes in the UHF spectrum that's not efficiently used. So, we feel that, you know, there's two fronts. You know, of course, getting new spectrum, develop new technologies that'll allow you to use the new spectrum - but, in addition, the existing spectrum - we should make sure that the existing spectrum we have, we use it very efficiently. Interviewer: Yes, now talking of the DSA - and it's got a very fast-growing membership - you have a major conference coming up in Akron, a few months' times. What are you hoping to get out of that? Angelo Cuffaro: We think it's really important to approach, you know, the new countries that are thinking of allocating new spectrum, for example. In this case, Ghana, for example, is looking at using TV whitespace spectrum. It's extremely important that they start on the right foot - and it's terms that they use the spectrum efficiently, you know, in the sharing of [unintelligible] approach, rather than doing the exclusive license use - which, in most cases, unless it's not, you know, properly handled - will lead to inefficient use of spectrum. So, to us, it's extremely important, from that perspective. Interviewer: So, there's a chance with developing countries to sort of get their act together on day one, rather than have to do a kind of a sticking plaster job later on. Angelo Cuffaro: Correct; exactly, yeah. I mean, and that's basically really important, from the DSA perspective. And in addition, I mean, also, the existing countries - you know, the countries that do have [unintelligible] spectrum - we still could develop some technologies that actually help share the spectrum. So, we could still go back. You've got the incumbents, you've got the TV whitespace model, you've got now the [unintelligible] model in the US, for example, that's using 3.5 gigahertz. So, you can still go back, and still try to fix it - but, yeah, definitely; if you can start from day one, get it right, then a much easier job later on. Interviewer: Tell us about InterDigital - because I know you guys are a globally, well-respected, you know, research company in your own right. Angelo Cuffaro: Correct, yeah. We've been actually in the wireless industry since the 1970s. We were actually one of the first companies to develop a fixed wireless solution for the developing countries. And, you know, based on that success, we've developed technologies, protocol stacks. In the cellular world, for example, we were one of the first stacks on the GSM side [unintelligible]. In addition, you know, we're a forward-looking company. We continue to develop technologies that are, like, light years ahead. For example, here, just behind me, we're looking at spectrum harvesting technology that uses TV whitespace. Next to me, we have millimeter WAV technologies. We're looking at the wireless back hall. We're also developing video solutions, as well, and we're also developing - we call it SAM - smart access manager - so, basically, an app on the phone that allows you to efficiently use both Wi-Fi and cellular at the same time. Interviewer: Okay. Well, thanks for talking to us. Angelo Cuffaro: Thank you. Interviewer: So, there we are. InterDigital, a globally-recognized company, recognizing the important work of the DSA.